ESGE recommends using 10-mL syringe suction for EUSguided sampling of solid masses and LNs with 25G or 22G FNA needles (high quality evidence, strong recommendation) and other types of needles (low quality evidence, weak recommendation). ESGE does not recommend for or against using the needle stylet for EUS-guided sampling of solid masses and LNs with FNA needles (high quality evidence, strong recommendation) and suggests using the needle stylet for EUSguided sampling with FNB needles (low quality evidence, weak recommendation). ESGE does not recommend antibiotic prophylaxis for EUSguided sampling of solid masses or LNs (low quality evidence, strong recommendation), and suggests antibiotic prophylaxis with fluoroquinolones or beta-lactam antibiotics for EUS-guided sampling of cystic lesions (low quality evidence, weak recommendation). 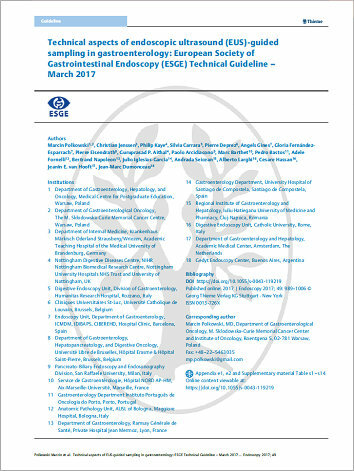 ESGE suggests that evaluation of tissue obtained by EUSguided sampling should include histologic preparations (e. g., cell blocks and/or formalin-fixed and paraffinembedded tissue fragments) and should not be limited to smear cytology (low quality evidence, weak recommendation).